[137 Pages Report] The report on top packaging trends provides a detailed information regarding the major factors influencing the growth of each trend/market (drivers, restraints, opportunities, and challenges). It also includes the key players’ profiles and analysis of their recent developments for the top packaging trends. To define, describe, and forecast the packaging market segmented on the basis of type/ technology. To provide detailed information regarding the major factors influencing the growth of the packaging market (drivers, restraints, opportunities, and industry-specific challenges). To analyze the opportunities in the market for various stakeholders by identifying the high-growth segments of the top packaging trends. To profile the key players and comprehensively analyze their market position in terms of the ranking and core competencies, along with detailing the competitive landscape for the market leaders. The research methodology used to estimate and forecast the packaging market begins with obtaining data on key vendor revenues through secondary research. Some of the secondary sources used in this research include information from various journals and databases such as published journals, Factiva, Hoovers, and OneSource. The vendor offerings have also been taken into consideration to determine the market segmentation. The bottom-up procedure has been employed to arrive at the overall size of the packaging market from the revenues of the key players in the market. After arriving at the overall market size, the total market has been split into several segments and subsegments which have been then verified through primary research by conducting extensive interviews with people holding key positions in the industry such as CEOs, VPs, directors, and executives. The market breakdown and data triangulation procedures have been employed to complete the overall market engineering process and arrive at the exact statistics for all segments and subsegments. The top packaging trends ecosystem has various key players such as Amcor Limited. (Australia), E.I. du Pont de Nemours and Company (U.S.), Bemis company, Inc. (U.S.), Sonoco Products Company (U.S.), Huhtamaki OYJ (Finland), Linpac Packaging (U.K.), The Dow Chemical Company (U.S.), Avery Dennison (U.S.), Sealed Air Corporation (U.S.), and Coveris Holdings S.A. (U.S.). In the modified atmosphere packaging market, deep-drawing machines dominated the market in 2015; the segment is projected to grow at a moderate CAGR during the forecast period. Deep-drawing machine is a package wrapping machine. Horizontal and vertical flow packaging machines are machines that are majorly used for sealed packaging through gas flushing and shrink packing. Hence, both these machines have unique functionalities, which are frequently used for MAP (modified atmosphere packaging). The global MAP machinery/technology market is projected to register a constant growth between 2016 and 2021, due to various innovations and technological advancements in the field of MAP machinery/technology. 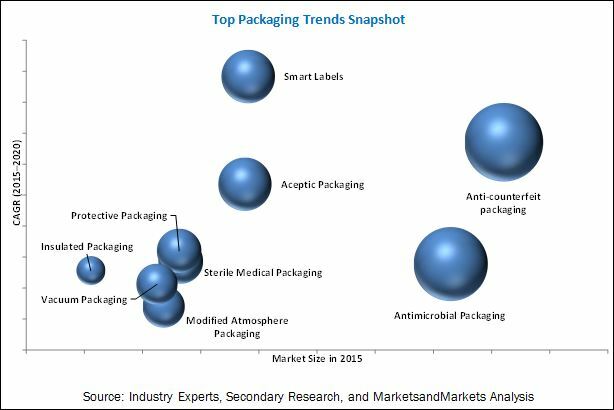 The aseptic packaging market has been growing in accordance with the packaging industry. Factors such as increasing urban population, demand for pharmaceutical supplies, and the changing mindset of consumers towards the usage of food preservatives have driven the growth of the global aseptic packaging industry. With increasing demand for convenience and quality food products, people are opting for packaged food products, which is an opportunity to aseptic packaging manufacturers. A smart label is a conventional print-coded label, with an extremely flat item identification chip inside it, which includes chips, antenna, transceivers, and bonding wires. It is usually made of paper, fiber, or plastics. Along with its ability to identify products in the supply chain, smart labels also allow companies to share the product location; this ability to share information about the location of products makes smart labels a potentially useful technology. Additionally, smart labels can also provide protection against theft, loss, and counterfeiting. Smart labels provide better tolerance in fully automated reading from a certain specified distance, which eliminates errors and improves efficiency. The technology segment of the smart labels market includes electronic article surveillance (EAS) labels, radio frequency identification (RFID) labels, sensing labels, and electronic shelf labels (ESL)/dynamic display labels. The smart labels market is in its growth phase. In 2015, RFID labels accounted for the maximum share in the overall smart labels market, whereas the ESL market, a newly introduced technology, is expected to grow at the highest rate from 2016 to 2021. The EAS labels market is in the matured phase and is expected to grow at a relatively slower rate during the forecast period. The need for high initial capital investments has caused an unfavorable impact on the profitability of the packaging industry. The global top packaging trends is dominated by players such as Amcor Limited (Australia), E.I. du Pont de Nemours and Company (U.S.), Bemis Company Inc. (U.S.), Sonoco Products Company (U.S.), Huhtamaki OYJ (Finland), Linpac packaging (U.K.), The Dow Chemical Company (U.S.), Avery Dennison (U.S.), Sealed Air Corporation (U.S.), and Coveris Holdings S.A. (U.S.). Figure 1 Revenue Generated By Pharmaceuticals and Medicines in the U.S.